One word ‘resonant with joy or melancholy, the other sinister, ashy’. It became a text to be partly spoken, peeled off the page, but never quite so, a text from memory and a text that is read and spoken inside your head – hence the rhythm which is never entirely flowing. The Italian poet Amelia Rosselli, who wrote in between three languages and wasn’t afraid of letting their structures coexist when she wrote in Italian, and who studied music, observed that sometimes written words hold sound, but this sound is in fact absence, and it only echoes in the reading mind and it can never be only sound. rinascevo a peggior vita; testa tonda e guanti di feltro. Contavo perle e stringevo fra le braccia una pallida mummia. My new book, F.M.R.L. Footnotes, Mirages, Refrains and Leftovers of Writing Sound, will be published on 24 April. More details and updates to follow on this blog. Listening into writing, reading into writing take shape in F.M.R.L. through a collection of short texts, fragments and deranged essays, with attention to pacing and linguistic derives. An archive of books, notebooks, events and records prompts the texts in these pages, responding to encounters with Michel Leiris’s autobiographical fictions; concerts and events at Café Oto and the Swedenborg House in London; visits to museums such as the Pitt Rivers in Oxford and exhibitions such as Ice Age Art at the British Museum, among the others. The attention dwells on the peripheral—accidents of hearing, recalled stories, detours of thought—rather than any assumed core, up to the point when the very core of the book becomes what is normally deemed peripheral. Taking its title from Louis Aragon, F.M.R.L. (Ephemeral: Frenzy, Madness, Reverie, Love) is ‘a recording of a three-year long improvisation in writing’: it reclaims the complexity and intermittent incoherence in listening and reading, and it works with their residual aspects addressing reference, canons, issues of authenticity and fabulation, degrees of opacity and transparency, across languages and cultures. F.M.R.L. makes claims for confusion and unexpected minutiae rather than supporting any grand, encompassing narrative of listening. It is not concerned with making sense univocally, but with exploring possibilities for meaning and for writing sound. F.M.R.L. is a book constructed across sonic patterns, assonance, repetitions, comprising texts that intermittently drift from sense to sound and to nonsense and back. A flip from the immateriality of sound to the sounds of letters and words as material, a call from reading to voicing. 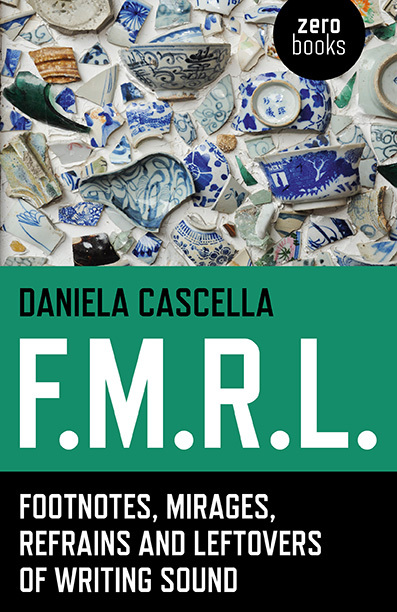 ‘Daniela Cascella is the most literary listener I know. In the frenzy of ephemera collected here, she catches echoes between films and philosophy, sculpture and drama, music and novels. Grounded in French surrealism, Italian narrative, and American poetry, F.M.R.L. auscultates books by some of the most magical writers from the past century: Clarice Lispector, Gert Jonke, and — above all — Michel Leiris. In the process, Cascella investigates the very logic of sound: its recursiveness; its decay; its interference patterns and resonant sympathies. Attending to the blur of voices into noise at the borders of understanding, Cascella gives back the songs of sound’s extended techniques, transmuting noise back into poetry at the borders of these pages. F.M.R.L. is a Passagen-werk of the inner ear’. Allen S. Weiss, author of Varieties of Audio Mimesis (Errant Bodies, 2008) and Zen Landscapes (Reaktion Books, 2013). This is writing in its most present sense. Writing that, true to its tense, enacts a continual process of thinking and perceiving. Writing that, spinning its words from sound, gathers up referents in a loose weave. Expansive in scope, and intimate in scale, this is writing where reading dwells in the reverie of detail—and deserves our full attention.